Zionists get very defensive when a comparrison is made to the present situation in Occupied Palestine to that of the Jews living under nazi occupation. In that light, I will not add any commentary here, except to ask one question…. CAN YOU SEE THE SIMILARITIES??? 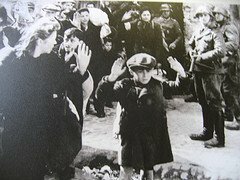 Children under the age of around 12 were generally deemed unfit for work and were therefore immediately taken to the gas chambers. However, death may have been preferable because those who were allowed to work were treated with equal contempt by the SS. Upon having their prisoner ID tattooed on them, the children were sent to work in either a factory, quarry, or some other strenuous and monotonous place of work. Their shifts lasted from 10 to 14 hours. After the day’s work was finished, the children were subjected to incredibly long roll calls, during which some even died. This routine continued for what could be months until the prisoners were either sent to the gas chambers or died from malnourishment or exhaustion. The following is taken from THIS report on Israeli prisons.Thanks to Sabbah for originally posting this segment. Many Palestinian children in Israeli Telmond Prison are being exploited by “forced labor in which they must work eight hours for a few shekels,” as reported by the Prisoners Information Center. One of the children made a statement after his release. “The prison administration has forced all prisoners in Telmond Prison to work eight hours for very low wages.” He went on to say, “The Israeli soldiers come to the chambers at seven and force us to go with our legs tied with chains.” The child added that his job was to stand under guard and pack plastic spoons in boxes. There are approximately 375 Palestinians in Telmond Prison, with most of them being children. The oldest Palestinian in Telmond is 22 years old. The child laborers are given two meals per 24 hours, one at 11:00 pm and another at 6:00 am. According to the Information Center there are 200 children less than 16 years old in Israeli prisons begin subjected to some of the worst forms of exploitation and humiliation. A total of 376 Palestinian children are currently imprisoned in Israeli prisons and detention camps. Steve, again you have a great post, I have a agree the comparisons are very similar and it looks as if History is repeating itself. Sorry, met to say history repeating it self, only the players and countries are different. I read your article and cried, Desertpeace. Afterwards, I forced myself to realize that child labor is only the beginning of Zinofascism’s horrorshow. Lebanon and Gaza are thousands of times worse in terms of sheer volume of human suffering. I wonder if Palestinian prisonworkers get Shabbat off… I’ll bet they don’t. Personal question (answer it only if you want): Why do you continue to live in Israel? How much change can you really effect there? Thanks Chet… unfortunanate but true. Good to see you behemoth…. sorry if I upset you, but these facts cannot remain hidden. So sad but so true. Where did we go so wrong? From the very beginning of the Zionist movement or since 1967? Good to see you lennybruce… interesting comment. Wherever ‘we’ went wrong can still be made right… that is my hope. Let there be no misunderstanding. I also believe that things can still be made right. It won’t be easy and the politicians will continuously get in the way as will those who hate. And its not so much that I ‘hope’ things can still be made right, but that there is no choice. The alternative is unnacceptable. The similarities are uncanny, Steve. The idea of a wall along the ’67 line might be plausible, but it’s obvious the way it meanders through Palestinian areas and around Israeli “colonies” that it’s purpose is to establish unilateral borders. And to harass the Palestinians. It makes for a plausible to ask people for their papers. Why don’t we just give up the charade and just make the Palestinians wear yellow badges? Let’s be honest about what we’re doing here. I say “we” because the people of the United States know damn well what’s going on. It’s a bit like the Germans who lived next to the concentration camp and claimed they didn’t know anything about Jews being incinerated, but they told their grand children stories about how they had to clean the ashes off their houses every day. Right, Gramps. You didn’t know anything. I know no one believes you, but I believe you. Americans are as complicit in this as any Israeli, if not more so. So true what you said Dean… but it’s not just the USA that is ‘guilty’…. it’s the entire world! No one can say any longer ‘that we didn’t know’… the facts are out there in the open for all to see. this article is proof that people want to believe the very worst about Israel. The article is silent on who are these “child prisoners”? Are they, perhaps, Hamas soldiers? Is a 22-year old a “child prisoner”? Why not compare any “unfair” people to Nazis? Are Russian soldiers the new Nazis? Are Turkish the new Nazis because they refuse to give independence to Kurds, who are a bigger ethnic minority than Palestinians. Actually Martin, I see this article as proof that the zionists are acting to the Palestinians as the nazis acted to the Jews. A child is not a Hamas soldier… those are the lies spread by the zionists.. not by me. As far as other comparrisons… I do not see the Turks conducting acts of Genocide against the Kurds.. they did at one time do it to the Armenians… that is not forgotten. So actually Martin, this article is not silent at all… it says quite a bit… enough in fact to outrage the zionist community in England… who btw to date have not denied any of the comparrisons I made.